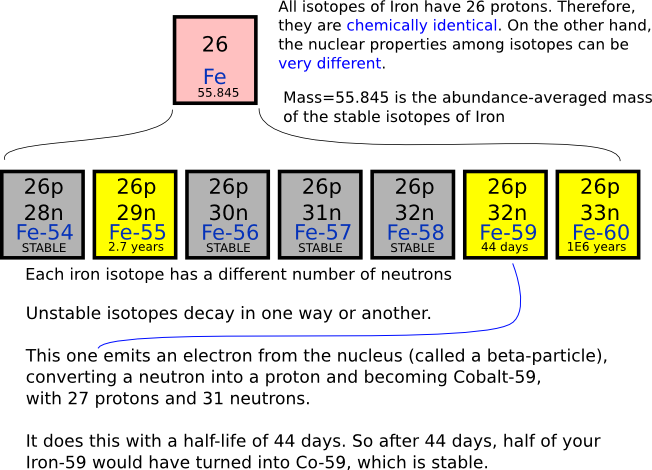 What are Isotopes and Nuclides? Having a basic understanding of isotopes and nuclides is vital to understanding many aspects of nuclear energy. Here we present a quick and simple review (or preview!) of science class. Elements are your basic chemical building blocks. They include things like hydrogen, oxygen, sodium, magnesium, iron, titanium…, anything on the periodic table of the elements. 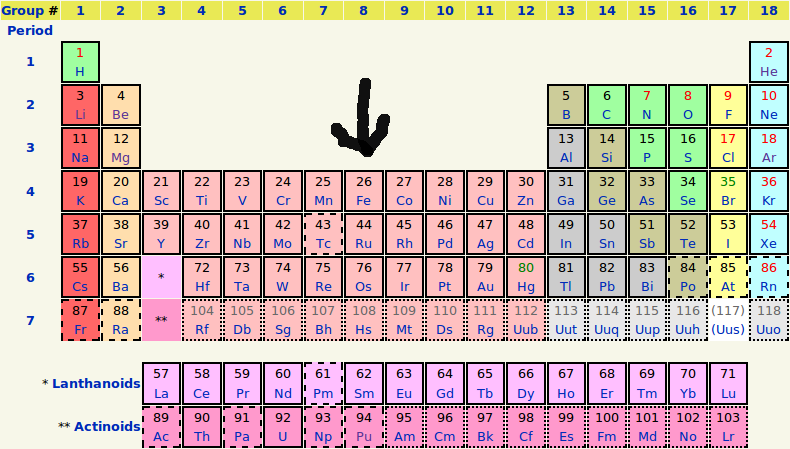 Each element on the periodic table has a different number of protons in its atomic nucleus (its dense center). Each element has a few varieties with the same number of protons, but different numbers of neutrons in the nucleus. All isotopes of a particular element act chemically-identically to each other. Figure 1 shows the periodic table of the elements. Each element listed has many (between 2 and 20+) isotopes. The arrow points to Iron (Fe), which has a few isotopes shown in Figure 2. Make sense? Great. 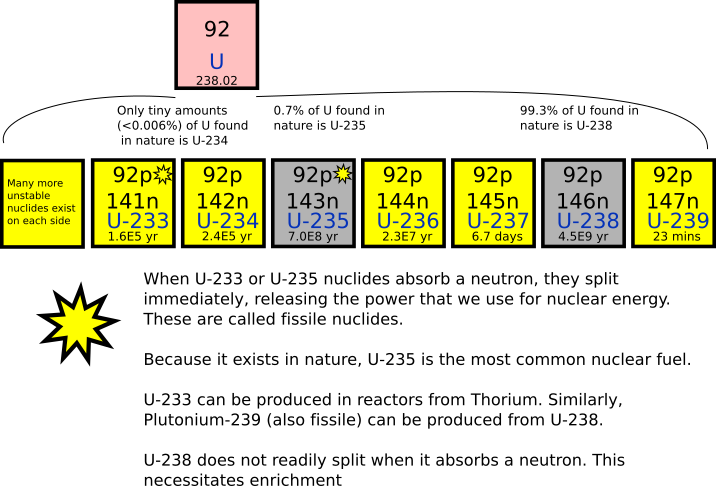 One particularly relevant set of isotopes acting chemically similar but neutronically different are those of the element Uranium, shown below in Figure 3. Now that you know what isotopes are, you can understand exactly what enrichment is. Natural Uranium is made up of 99.2745% U-238 and 0.720% U-235, with trace amounts of U-234. While U-238 usually stays together in a neutron field, U-235 readily splits, or fissions, in the presence of neutrons, releasing huge amounts of energy. This energy runs nuclear reactors and nuclear weapons alike. To create a chain reaction, you must enrich natural Uranium to contain more U-235. A typical nuclear reactor requires about 3.5% U-235, whereas a nuclear weapon requires more than 90% U-235. See figure below. Enrichment is a very difficult process, as the mass difference between each isotope is minuscule. The US developed enrichment at Oak Ridge during World War II as part of the Manhattan Project. The newsworthy item about it is that anyone who can enrich can create highly-enriched uranium, a good material with which to make nuclear weapons. Countries that want to have their own nuclear fuel manufacturing capabilities argue that they need enrichment plants, but opponents argue that they are just looking to produce nuclear weapons. Many people use them interchangeably, including experts in the field. Just read the MCNP manual!